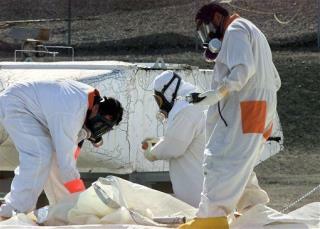 A New Nuclear Waste Solution: Use It for Fracking? (Newser) – In a story seemingly designed to make a certain kind of environmentalist reach for a drink, researchers this week proposed a new solution for storing nuclear waste: using it as fracking fluid. The idea is that because nuclear waste is heavier than the rock you'd be shooting it into, it would sink, charting an unerring path toward the Earth's core, and never bothering humanity again. "It's basic physics here," the study's co-author said, according to LiveScience. "If it's heavier than the rock, the fracture will propagate down."